But the idea that water injection systems are band-aid solutions for technical incompetents would startle some of the best engineers that have ever worked on engines – from pioneers of the combustion engine nearly 80 years ago, to those designing WWII fighter aircraft engines, to much more recent World Rally Cars. So let’s set the record straight... but first, a timeline of water injection application. Water injection was first experimented with in the 1930s. At the time it was discovered that detonation could initially be prevented by enriching the air/fuel ratio. As cylinder pressures rose still further and that approach ceased being effective, the injection of water into the intake air stream was found to prevent detonation. Interestingly, the detonation remained suppressed, even if the air/fuel ratio was then leaned-out. This occurred because the excess fuel was being used to cool the combustion process. When water replaced fuel in performing this function, less fuel was then required. ...the engine was run on an economical mixture, ie about 10 per cent weak, and supercharge applied until the first incidence of detonation, which occurred when BMEP* reached 168 psi. The mixture strength was then increased, step by step, and more supercharge applied until the same intensity of detonation was recorded; this process was continued until a point was reached at which no further enrichment was effective. In fact, after about 60 per cent excess fuel, not only did further enrichment have no effect but there was even some indication that it increased the tendency to detonate. A finely pulverized water spray was then delivered to the induction pipe, which served to suppress detonation, in part by the intercooling it provided, and in part by the influence of steam as an anti-detonant, and so allowed of further supercharging. This was continued progressively, admitting just sufficient water at each stage to ward off detonation, until a BMEP of 290 psi was reached [indicative of approximately a 73 per cent increase in torque!] , which was found to be the limit of the dynamometer. At the same time it was noted, that with the addition of water, the influence of steam as an anti-knock allowed of the fuel/air ratio being much reduced.... In fact, with water injection, no appreciable advantage was found from the use of an over-rich fuel/air mixture. With water [injected] alone, however, evaporation of the water was by no means complete even at the highest degree of supercharge, and it was found more effective to add a substantial proportion of some volatile alcohol, such as methanol, in order to increase the volatility... Methanol, however, is very prone to pre-ignition and, on this score, it is unwise to use too great a concentration; the safe limit appears to be a 50/50 methanol/water mixture. During World War II, water injection was extensively used on both Allied and Axis aircraft. These aircraft were all powered by piston engines; most were supercharged. In the 1940s NACA (the predecessor to NASA) reported extensively on water injection experiments. In NACA report No 756, The Induction of Water to the Inlet Air as a Means of Internal Cooling in Aircraft-Engine Cylinders, the engineers conducted tests over the period December 1941 to March 1942. The tests were carried out on a single cylinder 202 cubic inch (3.3 litre) air-cooled engine with a compression ratio of 7:1, a fixed spark advance of 20 degrees, an engine speed of 2000 rpm and an inlet air temperature of 250 degrees F (121 degrees C!). Water as an internal coolant is of interest as a means of suppressing knock in short bursts of high power output, that is, during take-off and during combat manoeuvres. In these cases it would probably be necessary to use a water-alcohol mixture to prevent freezing. Such a procedure would permit high powers during take-off with a fuel of a low octane number. ...it is estimated that for a water-fuel ratio of 0.6, an engine requiring a fuel of 100-octane number could operate satisfactorily on a fuel of 80-octane number... The data indicate that the permissible decrease in octane number for moderate quantities of water injected is considerable. The temperature of the rear spark-plug bushing at a fuel-air ratio of 0.067 [ie air/fuel ratio of 14.9:1] showed a change of only 18 degrees F as the permissible indicated mean effective pressure [IMEP*] was increased from 180 to 305 through the induction of water at a water-fuel ratio of 0.6. [However] the exhaust-valve-guide temperature showed a considerable increase as the maximum inlet pressure was increased with the water injection. This increase is probably caused by the increased mass flow of the gases passing around the exhaust valve and possibly also through increased gas leakage past the guide, resulting from the higher exhaust pressures that occurred.... The temperature of the head between the valves showed a noticeable decrease for the higher values of water-fuel ratio, even though the engine power was increased. Water injection allowed a fuel to be operated above its normal maximum permissible performance limits. 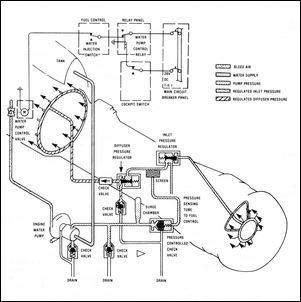 Water injection allowed a fuel to be operated at a higher indicated mean effective pressure, with a lower indicated specific fuel consumption, or with both, than was permitted without an internal coolant. Water injection had a marked cooling effect on the engine head and cylinder. The exhaust-valve guide was the only point on the head at which the temperature showed a tendency to increase with indicated mean effective pressure. The temperature was less, however, than that obtained with a straight [higher octane] fuel permitting an equivalent power. Water injection showed no advantage in fuel economy when the fuel was operated well below its maximum permissible performance limits. Water injection might be a disadvantage if the engine cooling affects are carried to an extreme and cause crankcase-oil dilution. Operation at normal engine and crankcase-oil temperatures should minimize crankcase-oil dilution. Another NACA paper, this time produced in August 1945, is Effect of Water-Alcohol Injection and Maximum-Economy Spark Advance on Knock-Limited Performance and Fuel Economy of a Large Air-Cooled Cylinder. The knock-limited power at an engine speed of 2100 rpm was increased as much as 88 per cent by operation at a fuel-air ratio of 0.06 [16.6:1 AFR] and a coolant-fuel [ie water-fuel] ratio of 0.4. An increase in the coolant-fuel ratio from 0.2 to 0.4 was 2.5 times as effective in raising the knock-limited indicated mean effective pressure [IMEP] at a fuel-air ratio of 0.075 [13.3:1 AFR] as an increase in the coolant-fuel ratio from 0.0 to 0.2. In the Aviation Machinist’s Mate 3, published in 1957 by the US Department of the Navy as a training text, water injection on piston aircraft is further discussed. ....the carburettor or fuel injection system supplies an excessively rich mixture for [internal] cooling purposes at high-power operation. A leaner mixture would produce more power but the additional fuel is required to prevent overheating and detonation. With the injection of water into the induction system, the mixture may be leaned-out to a rich best-power fuel-air ratio, and the vaporization of the fluid then provides the cooling formerly provided by the excess fuel. Operating at their best-power mixtures, the engines will develop more power even though the rpm and manifold pressure settings remain unchanged. In most installations water cannot be used alone because of the water freezing in the tank or lines either on the ground or in the air, and alcohol is therefore added to the water. The mixture is generally 50 percent water and 50 percent alcohol; however, in cold weather operation, 60 percent alcohol may be used. By the use of water injection, power may be increased from 15 to 25 percent, thus the effective Performance Number of grade 115/145 fuel may be raised to 168/182. The water injection system discharges the water/alcohol mixture into the induction system and, at the same time, causes a leaner air/fuel ratio and an increase in manifold pressure. To avoid detonation, a 50:50 mix of distilled water and methyl alcohol (ie methanol) was injected between the carburettor and turbo at times of high engine load. It is said that, depending on driving style, the content of this 4.7-litre reservoir could be consumed in anywhere from 3600 to 360 kilometres! 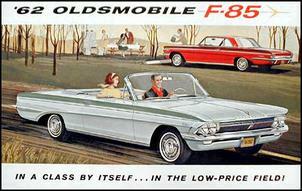 The reservoir was meant to be refilled only with the premixed 'Turbo Rocket Fluid' available from Oldsmobile dealers. However, many owners chose to make their own concoction using plain tap water. In this period water injection kits were also available for naturally aspirated cars, however the kit manufacturers often made wild claims about resulting fuel economy benefits – perhaps the start of a public disenchantment with the idea of water injection. Turbo kits of the 1970s often used water injection – off-the-shelf intercoolers were difficult to get and with only very few original equipment turbo road cars available, the engineering of these turbo cars was often rough and they drove badly. The water injection kits fitted to these cars – often comprising just a windscreen washer pump and a nozzle – were vastly cruder than the systems being used in aircraft thirty years before. In 1983 Renault started using water injection on their ~550hp turbocharged 1.5-litre F1 engine. The system used a 12-litre tank and a dedicated control unit. An electric pump, pressure regulator and pressure sensor were used. The system was triggered into action when manifold pressure exceeded 2.5 Bar (36 psi). It was said that the inlet air temperature reduction on these cars was 10-12 degrees C, dropping the intake air temp from around 60 to 50 degrees C.
In 1983 Ferrari also adopted water injection on their F1 engines. However, the water was added in a unique manner, being emulsified within the fuel itself before the fuel/water combination was injected. Apparently the water/fuel ratio was about 0.1:1. Up until a few years ago (when it was banned), most World Rally Championship cars used water injection systems. Water-fuel ratios as high as 0.25:1 were used. Testing was carried out in 1997 by Lars Eriksson of Sweden’s Linkoping University. This testing is important over earlier work because it used a modern automotive engine, state of the art engine monitoring, and fuel with an octane rating commensurate with normal automotive fuels. The engine used was a four cylinder (probably a Saab 2 or 2.3 litre) run with an air/fuel ratio of 14.7:1, held at 1500 rpm and with 55Nm of torque being developed. The water injection volume was unmeasured – a compressed air spray-gun was simply used to squirt fine water drops on the throttle butterfly as the engine ran on the engine dyno. This lack of precise relationship between fuel and water additions is also useful, because it shows what effects can be gained by even a non-optimal water injection system. After the water injection started, the peak cylinder pressure occurred 4 degrees later and output torque decreased slightly. However, advancing the ignition timing gave about 2 per cent more torque than was achieved without water injection. In 1999, R Lanzafame of the University of Catania conducted tests on a single cylinder CFR (variable compression ratio) engine. Low octane fuel was used with the water/fuel ratio varied over the range from 0 to 1.5:1. Water was supplied by a high pressure (up to 2 megapascal – 290 psi) pump through a single nozzle. Experimental test data show that water injection into an unheated manifold, when the engine speed is reasonably high, will not give water a sufficient time to vaporise during the compression stroke. Of course, in normal operation of a naturally aspirated engine the water does not vaporise until after combustion is well under way. This effect well explains why injection of water into very highly compressed or supercharged engines has been successful. It is well evident that water injection slows the combustion process down in SI [spark ignition] engines. Thus to maintain standard MBT [mean best torque] spark setting the timing should be advanced... when using water injection gasoline combinations. The use of water injection in water/fuel ratios from 0-1.5:1 caused the research octane number (RON) to rise from 70 to 93 and the motor octane number (MON) to increase from 64 to 90. NOx emissions were substantially decreased, being reduced by more than 50 per cent when a water/fuel ratio of 1.5:1 was employed. Lanzafame suggests that the best results of water injection come with a water/fuel ratio of 1.25:1. 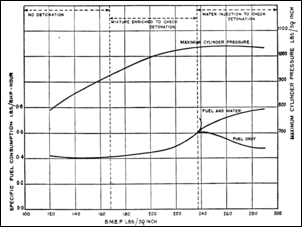 With an intake air temp of 143 degrees C and a water/fuel ratio of 1:1, the paper shows that peak cylinder pressure occurred about 20 crankshaft degrees later and that the peak cylinder pressure was reduced from 56 Bar to 37 Bar. With water injection occurring, rapid fluctuations in peak pressure were also much reduced. Exhaust gas temperatures also dropped, falling from 705 degrees C with no water injection to 692 degrees C with a water/fuel ratio of 0.5:1, 675 degrees C with a water/fuel ratio of 1:1, and 665 degrees C with a water/fuel ratio of 1.5:1. The data presented in this story is just a small sample of the information available from scientific and engineering sources. There’s absolutely no doubt that water injection, if properly engineered and integrated with the existing engine management system, can be highly effective. There is sound engineering behind the use of water injection. Water injection, with or without added alcohol, can massively increase the effective octane rating of fuel. The amount of water that has a positive effect can be as small as 10 per cent of the fuel flow (a water/fuel ratio of 0.1:1) and as high as 150 per cent of the fuel flow (a water/fuel ratio of 1.5:1). The water should be added in a fine spray. When water injection is being used, the air/fuel ratio can be leaned out at high loads without increasing the likelihood of detonation. When water injection is being used without any other engine ‘tune’ changes simultaneously being made (eg more advanced ignition timing, increased boost, increased compression ratio), power is likely to decline. Lower combustion temperatures are likely to lead to reduced heat load on the cooling system and lower exhaust gas temperatures. Water injection has a positive effect on emissions, especially in relation to NOx. It’s all food for a lot of thought isn’t it? Surprising at it may be to some, water injection has also been used on jet aircraft. Aircraft Gas Turbine Powerplants, published in 1979, shows this water injection system as typical on early jets and suggests the Boeing 707 used 300 US gallons (1136 litres) per engine in a 3 minute take-off climb. The publication suggests a typical ‘takeoff wet’ increase in thrust of 10-15 per cent, resulting from the ability to flow more fuel without exceeding maximum temp limits.